There are countless accessories available for storage in the market place. Your closet designer can help you filter through the various options. Accessories such as Belt Racks, Tie Racks, Valet Rods, Hooks, Pull-out Mirrors/Ironing boards, Shoe Shelves, Locks, Jewellery Inserts, Wire Baskets, Laundry Hampers, etc… are cleverly installed within a closet organizer to greatly enhance your daily experience. Everything you need is located in your closet. There is nothing more luxurious than opening a drawer and finding a black velvet lined custom made jewelry drawer insert displaying all your favorite pieces of jewelry, watches or perhaps a sunglass collection. These drawers can also be concealed if safety is a concern and come with a lock and key if required. They are fully extendable and available with a soft close mechanism. Lights can also be installed which turn on only when a drawer is pulled open. 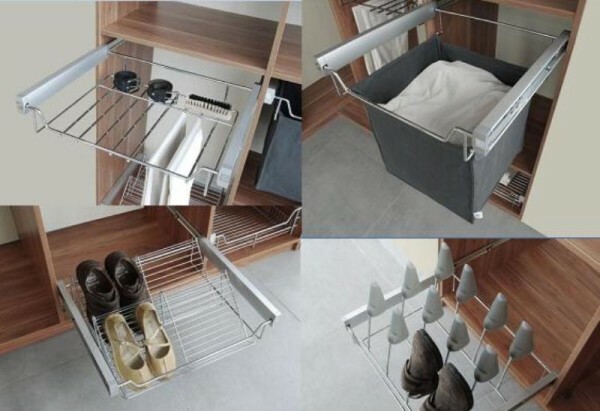 That is just the start…we have variety of pull out shelves, trays and baskets in various colours and finishes to ensure ease of use with every trip to your closet. Pulls down hanging rods enable you to reach those hard to access places without using a step stool. Extra wall space can be filled with hooks to display your hat collection or provide easy access to frequently worn items such as bathrobes. We can help you use every part of your closet to maximize your space.